These materials are provided for others to use in publicizing the conference. 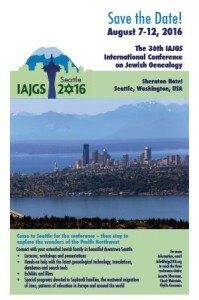 If used online, please link the conference logo, or use a text link, to lead your readers back to this website, at http://iajgs2016.org/. Seven logo files are available. * CMYK is usually used only for print while RGB is used for web sites. Please choose the appropriate file for your needs or the colors in the logo may appear radically different than they should. Our current flyer is available as a PDF.